January 17, 2019 By Allyson 15 Comments This post may contain affiliate links. Read my disclosure policy. 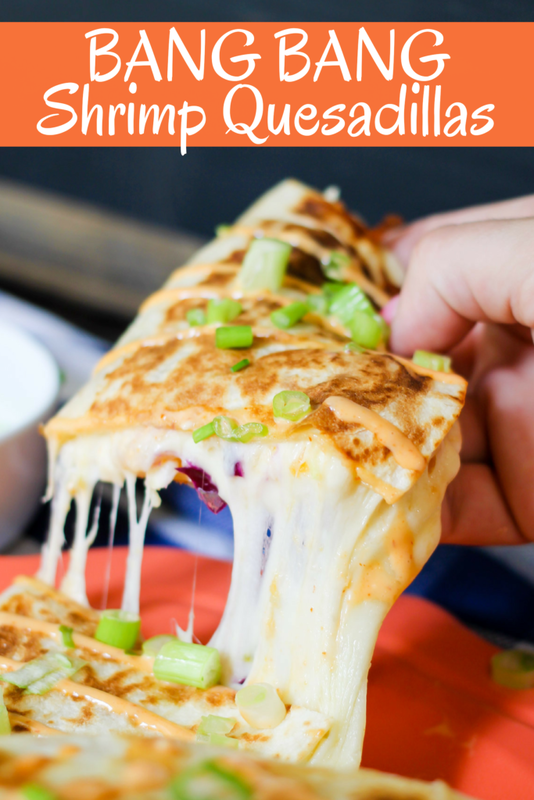 Shrimp, sweet & spicy bang bang sauce, cheese, and slaw all grilled between tortillas make these Bang Bang Shrimp Quesadillas the perfect meal or appetizer! Bang Bang Sauce is a total staple at my house; it’s easy and works well with so many dishes. Instant Pot Bang Bang Chicken was the most popular recipe on Domestic Superhero in 2018, everyone LOVES Bang Bang Shrimp Egg Rolls, Shrimp Tacos, and Bang Bang Tofu is the most popular tofu recipe! 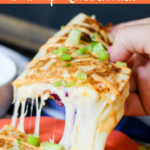 Making Bang Bang Shrimp quesadillas is so easy and everyone will love them! These make the perfect lunch, dinner, or appetizer! As I said, Bang Bang Sauce is a staple in our house. I suggest making a jar and just keeping it in your fridge at all times! Bonefish Grill’s Bang Bang Sauce is popular for a reason, it’s delicious! It’s also VERY easy to make yourself. I’ve used it for Bang Bang Tofu, Bang Bang Shrimp Tacos, Instant Pot Bang Bang Chicken, and Bang Bang Shrimp Egg Rolls, and they were all majorly tasty! Close the jar and let the sauce meld in the fridge. I like using a SAUCE BOTTLE for my Bang Bang sauce because then it’s easy to squirt on whatever I want it on! You have a few options when it comes to the shrimp in this recipe. I have made them all ways, and can honestly say I don’t have a preference. I don’t think it makes THAT big of a difference in the recipe, because you get a lot of crunch from the crispy tortillas, so leaving the shrimp boiled is okay in my opinion. However, you can also fry the shrimp before adding them. Alternatively, you can use pre-fried shrimp, and I would just cook them before you use them in the quesadillas so they aren’t frozen. use fresh or defrosted shrimp that are peeled, deveined, and patted dry. Dredge each shrimp in cornstarch, then add to a pan with hot oil. Fry a few minutes per side, until golden brown then set on a paper towel lined plate. Repeat for all, making sure not to crowd the skillet while cooking. Add shrimp to boiling water for 2 minutes, remove and set aside on a paper towel lined plate to dry. Defrost/cook according to package instructions; set aside. Take one tortilla, add cheese, shrimp, slaw, green onions, some sauce (not too much), more cheese, and then the top tortilla. Cook for a few minutes in a large skillet on each side over MEDIUM heat. Don’t turn the heat too high because it will burn quicker than the cheese can melt. Remove from pan, cut into fourths, then top with bang bang sauce and green onions. EAT! For dinner with a side of steamed or fried rice! Quinoa ‘fried rice’ is also a popular side dish at our house! 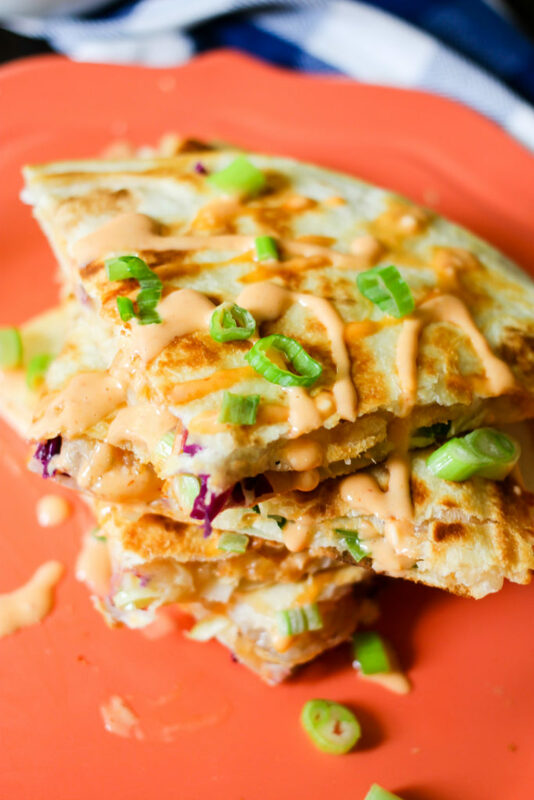 For lunch; Using frozen shrimp can save you tons of time and effort when making these Bang Bang Shrimp Quesadillas. Serve with a little bowl of roasted red pepper soup or a southwestern salad! During GAME-DAY! These make the BEST appetizer and everyone will go crazy over them! 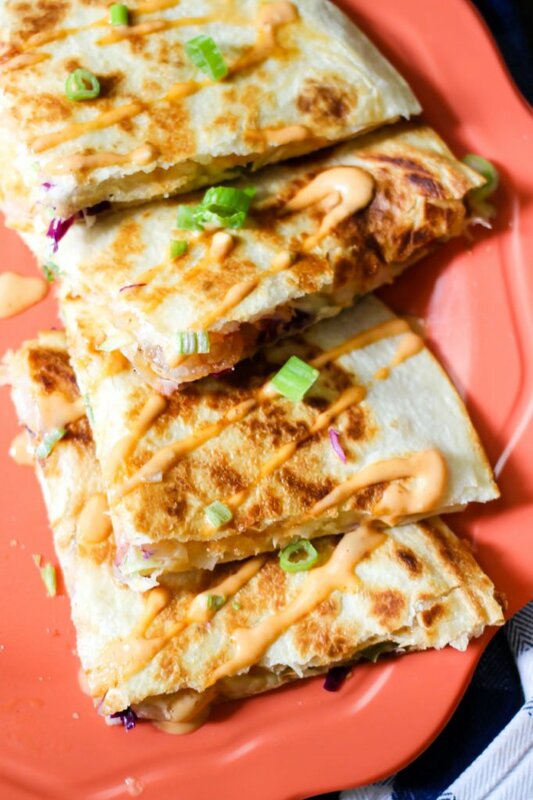 Using most of the same ingredients you can also make BANG BANG SHRIMP EGG ROLLS to serve alongside these quesadillas! Jalapeno Popper Cheese Ball is the perfect party appetizer! It’s creamy with a little kick and crunch, and it’s majorly delicious and super easy to make! Stuffed Spinach & Artichoke Cheese Bread has one secret ingredient that adds tang and creaminess that cannot be matched! This bread is INSANE! Pat defrosted shrimp dry. Toss in cornstarch until covered. Heat oil in a shallow skillet, until hot. Carefully cook shrimp in batches until done-do not overcrowd the skillet- place onto a paper towel lined plate. Cook all. Using a medium pot, fill about halfway with water, then bring to a boil. Carefully add shrimp and boil for about 2 minutes, stirring while cooking. Drain, set aside on a paper towel lined plate and pat dry. Cook shrimp according to package directions, set aside. Take one tortilla, add a few TBS of cheese, about 1/3 cup shrimp, 1/2 cup slaw, 1 TBS green onions, some sauce (not too much), more cheese, and then the top tortilla. Gently heat a large skillet over medium heat. Spray with nonstick spray or lightly coat with oil. Add quesadillas and cook 3-4 minutes on the first side, carefully flip then cook 1-2 minutes on the second side (will cook faster, watch not to burn). Remove from pan. Cut quesadillas into fourths, then top with bang bang sauce and green onions. EAT! Nutrition information calculated using boiled shrimp. These are definitely game day worthy! So amazing! Oh man, I love the flavors of bang bang shrimp, so in quesadilla form! Perfection. These are SOOO DELICIOUS!!! My family loved these quesadillas! We will be making these again, for sure! I am so happy you loved them as much as we did! Love that this is locked and loaded with flavor! All that cheese has me drooling. Mmmm they look very tasty. I do not know why I did not try it before. It sounds like a very tasty recipe. What a fun ingredient to add to quesadillas! I bet it adds so much flavor & that sauce looks so tasty! Our family is full of shrimp lovers! Can’t wait to try it! OMG, looks insanely delicious! This will quickly disappear on our table and I love all the flavors going on, need to make this! This cheese! 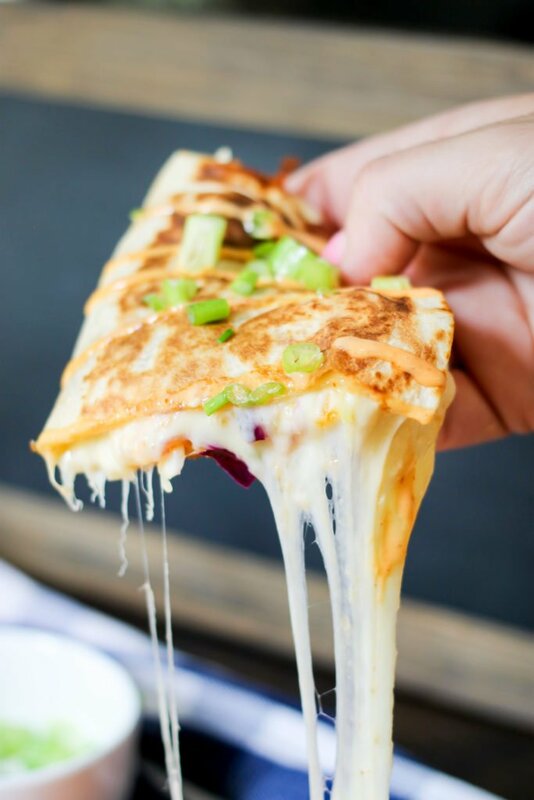 These quesadillas look absolutely amazing! Yummy! I am DROOLING! What a great idea…looks amazing! Do you cut the shrimp into smaller pieces before putting on the quesadilla? I don’t because they are already pretty small shrimp! You can if you want though! I’ll be making your sauce first thing tomorrow to have on hand! I’m sure I’ll add it to everything! This is such a great idea! Mmm!